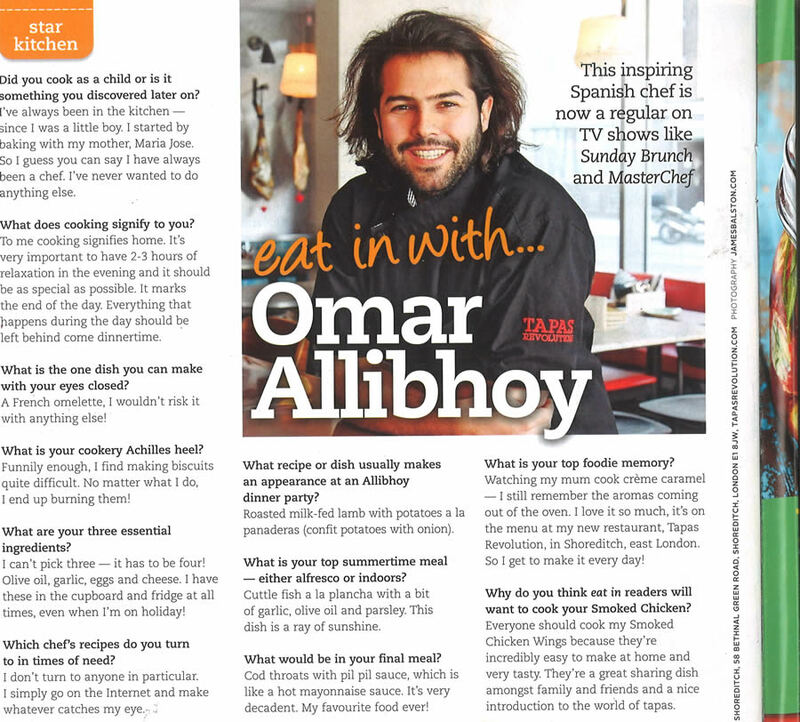 In August, Omar featured in Eat In Magazine’s ‘Star Kitchen’ section alongside his ‘one I love’ recipe Alitas de Pollo a la Miel y Limon (honey & lemon smoked chicken wings). Omar’s recipes took centre stage in the Summer edition of Jamie Oliver’s award-winning, recipe-packed food magazine ‘Jamie’. Recipes for spanish classic Chuletas a la Andaluza (Andalusian-style grilled lamb cutlets), chilled Salmorejo (tomato dip), Granada-style Alcachofas con Esparragos (artichokes & asparagus), BBQ-favourite Espeto de Sardinas (barbecued sardines), boozy feast Almejas al Fino con Jamon (clams with sherry & serrano ham), deliciously tender Sepia a la Plancha (griddled cuttlefish) feature alongside the ultimate Catalonian rice dish, Arroz a la Ampurdanesa. Ever wondered what sparked the Tapas Revolution? This definitive ‘cut-out and keep guide to Madrid’s best tapas bars’ in the Daily Mail is all you need to eat your way around Madrid. From ‘perhaps the most famous tapas bar in the world’ Casa Lucio to Michelin-starred chef David Garcia’s Albora to the century old Mercado de San Miguel, follow Omar as he takes you through the culinary highlights of his hometown. Proving once again that he’s up there with the best, not one but two of Omar’s signature recipes featured in the Observer Food Monthly’s ’20 Best Spanish recipes’ July 2015. Omar details how to recreate his famous ’Paella Valenciana’ – ‘the’ paella – at home with a recipe that is ‘the fruit both of my own investigations and those of top Valencian chefs and grandmothers’, or wow your guests with Omar’s ‘Chilled Tomato and Pepper Soup – ‘Buen Provecho!’ Check out the full list here. Shoreditch’s Pomelo Fizz made it into Waitrose Magazine’s ‘More of what you Love’ section - come on by to enjoy this ‘zingy Spanish-inspired number’! "easyJet Traveller features Omar in this double spread.” read more..
TAPAS REVOLUTION – A SUCCESS! Caterer and Hotelkeeper: ‘(Tapas Revolution is) a winner... adaptable and as simple or complex as you wish, it encourages chefs to highlight strong ingredients with flair and minimum fuss." Tapas Revolution was the Mail Online's Food Book of the Week! "His (Omar's) stated aim is to demystify things, making tapas an everyday option that can be rustled up from easily available, inexpensive and store cupboard ingredients. In this he succeeds triumphantly, with a collection of 120 mostly approachable recipes that take you by the hand and seduce you with their flavours, directness and simplicity. Virtually every page has something that says ‘Make me’ - from moreish nibbles, such as toasted bread with garlic and tomato, to brilliant eggy dishes, deeply flavoured stews, easy chicken suppers, inventive vegetable dishes, and fish dishes that conjure up outdoor restaurants overlooking the Mediterranean." more..
Omar was in today's London Evening Standard, speaking about his mission to get more people cooking tapas at home! Omar was in this Sunday's Observer Food Monthly 20 Best Summer Recipes special. Check out his Peas with Serrano Ham and Eggs recipe. The Times Magazine ran the second part of the Tapas Revolution cookbook serial this Saturday. Dishes included Omar's famous Paella, Chicken with Spanish Olives, and Catalan Custards. Tapas Revolution will be published by Ebury Press on 15th August. 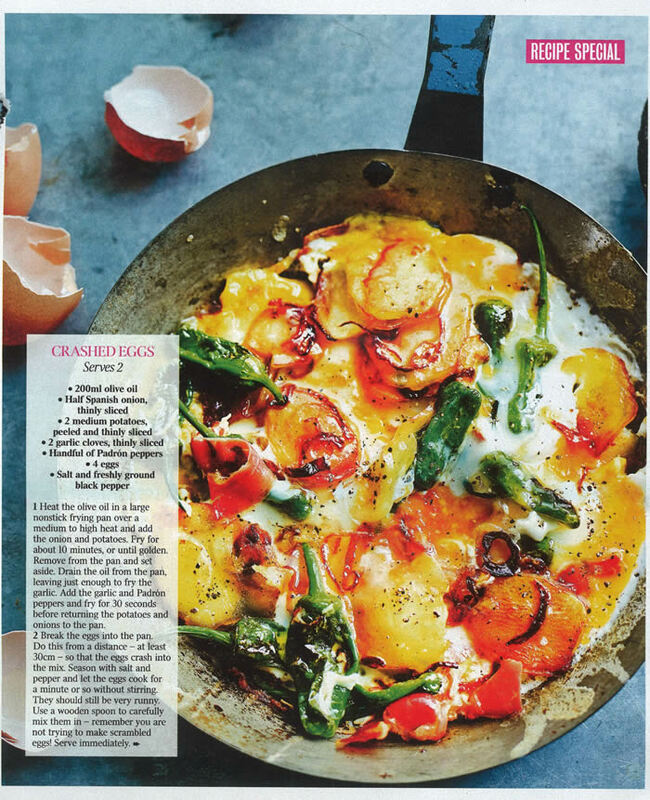 On Saturday, The Times Magazine were the first to run a selection of recipes from Omar's new cookbook, Tapas Revolution, which will be published by Ebury Press on 15th August. Look out for the second part of this serialisation in this Saturday's Times Magazine, 27th July. "THIS IS REAL FAST FOOD FOR PEOPLE WHO CARE ABOUT EATING"